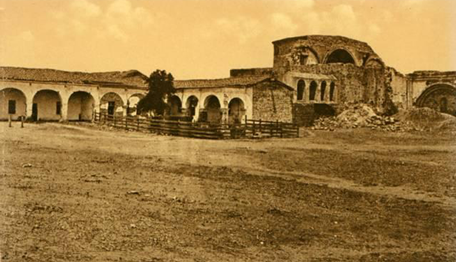 The San Juan Capistrano Mission was founded by Father Junípero Serra in 1776. Referred to as "The Jewel of the Missions", it is perhaps the best known of all the missions. Mission San Juan Capistrano was founded on October 30, 1775 to interrupt the long journey between Mission San Diego de Alcalá and Mission San Gabriel Arcángel. Mission San Juan Capistrano was originally established by Father Fermin Lasuén but just eight days after its foundation rumors that the Indians had attacked Mission San Diego de Alcalá came to the father’s ears. Thus, after having buried the mission bells to avoid being stolen, the founding Father and the other missionaries immediately came back to San Diego. A year later, Father Junípero Serra returned to the site and re-founded the mission on All Saints Day, November 1, 1776, naming the mission for Saint John of Capistrano, an Italian theologian and inquisitor of the 14th century. Because of the inadequate water supplies, the site of the mission was later relocated three miles to the west near the Indian village of Acágcheme. San Juan Capistrano Mission is one the best known and, for its striking beauty, it is often referred to as “The Jewel of the Missions“. The swallows (Las Golandrinas) are a peculiar feature of the mission and a group of them return every year to the mission premises on “St. Joseph’s Day”, March 19, to build their mud nests for the annual brood. The nearby local Indians, the Juaneno tribe, were friendly and industrious and helped the Spanish missionaries in the construction of the mission buildings. 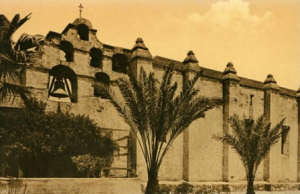 In 1777, the first adobe church was completed and in 1791 the mission bells were relocated in the new tower after having been hanging from a tree for 15 years. Works on “The Great Stone Church” were begun in 1796. Completed in 1806, the new church was built in the shape of a cross and had vaulted ceilings, seven domes, and four bells elevated in a 120 foot tall tower. 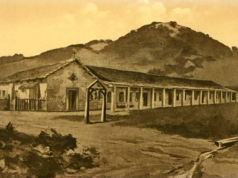 It is the only mission church in Alta California whose chapel was not constructed out of adobe. In 1779, wine grapes were planted at the Mission and in 1783 the missionaries produced the first wine ever made in Alta California. Unfortunately, an earthquake completely destroyed the stone church in 1812. 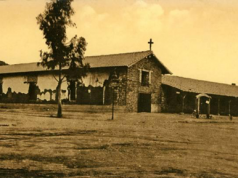 In 1834, Mission San Juan Capistrano was secularized and sold in 1845. In 1865, it was returned to the Church. 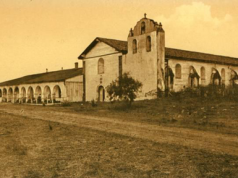 Today, the original adobe church, called “Father Serra’s Chapel”, has been restored and continues to function as a parish church while the ruins of “The Great Stone Church” remains as a renowned architectural wonder. Every year, nearly half a million people visit the mission premises, including 80,000 school children.